J. Perrotin discovered asteroid #252 Clementina. James Prescott Joule (24 December 1818 - 11 October 1889) was an English physicist. He studied the nature of heat, and discovered its relationship to mechanical work, which led to the theory of conservation of energy (the First Law of Thermodynamics). The SI unit of work, the joule (pronounced to rhyme with "fool"), is named after him. He worked with Lord Kelvin to develop the absolute scale of temperature, made observations on magnetostriction, and found the relationship between the flow of current through a resistance and the heat dissipated, now called Joule's law. J. Palisa discovered asteroid #320 Katharina. L. Carnera discovered asteroid #808 Merxia. A. Kopff discovered asteroids #613 Ginevra, #614 Pia and #615 Roswitha. J. Palisa discovered asteroid #734 Benda. K. Reinmuth discovered asteroid #942 Romilda. S. Belyavskij discovered asteroid #1062 Ljuba. G. Neujmin discovered asteroid #1734 Zhongolovich. G. Neujmin discovered asteroid #1309 Hyperborea. Reinhold Tiling (13 June 1893 – 11 October 1933) was a German rocket pioneer who developed wing-recovered black-powder-propelled rockets. Tiling was inspired to pursue rocketry when he heard Oberth lecture on the subject in 1924. Impatient to proceed with rocket control system development, and unwilling to wait for development of liquid rocket engines, he proceeded to work on rockets powered by compressed black powder. He began development of rockets with deployable wings for recovery and reuse in 1928. In 1929, he received funding from the German Navy, ostensibly for development of improved line-throwing rockets for ship-to-ship transfers. By 1931, his rockets were being fired to 7 km altitude and demonstrating stable flight through use of tail fins. He demonstrated the first launch of a rocket from an airplane in 1932, and in the same year was demonstrating variable wing deployment and parachute recovery of rockets. By 1933, he was demonstrating powder rockets with burn durations of as much as ten seconds. A fire broke out on 10 October 1933 in his propellant processing room where he used a proprietary process to compress black powder into solid rocket propellant. He, his assistant Angelika Buddenboehmer and his mechanic Friedrich Kuhr died from burns suffered in the fire and ensuing explosion. His brother, Richard Tiling, continued his work, conducting flight experiments at Cuxhaven in the summer of 1934, until further private development of rocketry in Germany was prohibited by the new Nazi government later that year. Y. Vaisala discovered asteroid #1631 Kopff. G. Neujmin discovered asteroid #3036 Krat; K. Reinmuth discovered asteroids #1438 Wendeline, #1439 Vogtia, #1440 Rostia, #1650 Heckmann, #1673 van Houten and #2749. The first "all-up" Wac Corporal launch took place at White Sands, New Mexico, which reached a record altitude with an apogee of 43.5 miles (70 km), reported in some places as the first man-made object to escape the atmosphere. The recovery system failed. T. Mitani discovered asteroid #1619 Ueta. NASA launched its first spacecraft, Pioneer 1 (Able 2), on a mission intended to reach Lunar orbit which fell short of that goal because of booster problems. Pioneer 1, the second and most successful of three project Able space probes and the first spacecraft launched by the newly formed NASA, was intended to study the ionizing radiation, cosmic rays, magnetic fields, and micrometeorites in the vicinity of the Earth and in Lunar orbit. Due to a launch vehicle malfunction (the third stage produced insufficient thrust), the spacecraft did not achieve escape velocity, attained only a ballistic trajectory and never reached the Moon. It did return data on the near-Earth space environment, having set a distance record when it traveled over 70,700 miles before returning to Earth, determined the radial extent of the great radiation belt, made the first observations of Earth's and the interplanetary magnetic field, and the first measurements of micrometeorite density in interplanetary space. Pioneer 1 consisted of a thin cylindrical midsection with a squat truncated cone frustrum on each side. The cylinder was 74 cm in diameter and the height from the top of one cone to the top of the opposite cone was 76 cm. Along the axis of the spacecraft, and protruding from the end of the lower cone, was an 11 kg solid propellant injection rocket and rocket case, which formed the main structural member of the spacecraft. Eight small low-thrust solid propellant velocity adjustment rockets were mounted on the end of the upper cone in a ring assembly which could be jettisoned after use. A magnetic dipole antenna also protruded from the top of the upper cone. The shell was composed of laminated plastic. The total mass of the spacecraft after vernier separation was 34.2 kg, after injection rocket firing it would have been 23.2 kg. The scientific instrument package had a mass of 17.8 kg, and consisted of an image scanning infrared television system to study the Moon's surface to a resolution of 1 milliradian, an ionization chamber to measure radiation in space, a diaphragm/microphone assembly to detect micrometeorites, a spin-coil magnetometer to measure magnetic fields to 5 microgauss, and temperature-variable resistors to record spacecraft internal conditions. The spacecraft was powered by nickel-cadmium batteries for ignition of the rockets, silver cell batteries for the television system, and mercury batteries for the remaining circuits. Radio transmission was at on 108.06 MHz through an electric dipole antenna for telemetry and doppler information at 300 mW and a magnetic dipole antenna for the television system at 50 W. Ground commands were received through the electric dipole antenna at 115 MHz. The spacecraft was spin stabilized at 1.8 rps, the spin direction was approximately perpendicular to the geomagnetic meridian planes of the trajectory. The spacecraft did not reach the Moon as planned due to an incorrectly set valve in the Thor-Able's upper stage, which caused an accelerometer to give faulty information leading to a slight error in burnout velocity (the Thor second stage shut down 10 seconds early) and angle (3.5 degrees). This resulted in a ballistic trajectory with a peak altitude of 113,800 km around 1300 local time. The real-time transmission was obtained for about 75% of the flight, but the percentage of data recorded for each experiment was variable. Except for the first hour of flight, the signal to noise ratio was good. The spacecraft ended transmission when it reentered the Earth's atmosphere after 43 hours of flight on 13 October 1958 at 03:46 UT over the South Pacific Ocean. A small quantity of useful scientific information was returned, showing the radiation surrounding Earth was in the form of bands and measuring the extent of the bands, mapping the total ionizing flux, making the first observations of hydromagnetic oscillations of the magnetic field, and taking the first measurements of the density of micrometeorites and the interplanetary magnetic field. USSR launched the E-1 s/n 2 Lunar spacecraft (Luna 1958B) from Baikonur on a Vostok-L 8K72 booster, which was intended to reach the Moon, but the launcher disintegrated at T+104 seconds due to longitudinal resonance in the strap-on boosters. Luna E-1 No.2, originally tentatively identified by NASA as Luna 1958B, was launched either 11 October or 12 October 1958, either at the same time as, or a few hours after NASA's Pioneer 1 mission was launched from Cape Canaveral, Florida (reports vary). This craft was an attempt to reach the Moon and impact its surface. The Luna 8K72 carrier rocket exploded 104 seconds after launch due to longitudinal resonance within the rocket's strap-on booster rockets which caused the vehicle to disintegrate. According to the reports which indicate this mission was launched a few hours after the Pioneer 1 mission, the Soviet Luna probe was on a faster trajectory and would have reached the Moon first. As events turned out, neither probe was successful: Pioneer 1's booster developed insufficient thrust for it to get to the Moon. See also NASA's Tentatively Identified Missions and Launch Failures page. NASA and the USAF launched X-15A Alt, Aero, Low q Test mission # 43, a partial failure when the outer panel of left windshield cracked, in which Robert White reached a maximum speed of 5869 kph (Mach 5.21), and a maximum altitude of 66.142 km. NASA's Lunar Orbiter 2 impacted the Moon. The Lunar Orbiter 2 spacecraft, launched 6 November 1966, was designed primarily to photograph smooth areas of the Lunar surface for selection and verification of safe landing sites for the Surveyor and Apollo missions. It was also equipped to collect selenodetic, radiation intensity, and micrometeoroid impact data. The spacecraft was placed in a cislunar trajectory and injected into an elliptical near-equatorial Lunar orbit for data acquisition after 92.5 hours flight time, on 10 November 1966. The initial orbit was 196 km x 1850 km at an inclination of 11.8 degrees. The perilune was lowered to 49.7 km five days later after 33 orbits. A failure of the amplifier on the final day of readout, 7 December, resulted in the loss of six photographs. On 8 December 1966 the inclination was altered to 17.5 degrees to provide new data on Lunar gravity. The spacecraft acquired photographic data from 18-25 November 1966, and readout occurred through 7 December 1966. A total of 609 high resolution and 208 medium resolution frames were returned, most of excellent quality with resolutions down to 1 meter. These included a spectacular oblique picture of Copernicus crater which was dubbed by the news media as one of the great pictures of the century. Accurate data were acquired from all other experiments throughout the mission. Three micrometeorite impacts were recorded. The spacecraft was used for tracking purposes until it impacted the Lunar surface on command at 3.0 degrees N latitude, 119.1 degrees E longitude (selenographic coordinates) on 11 October 1967. 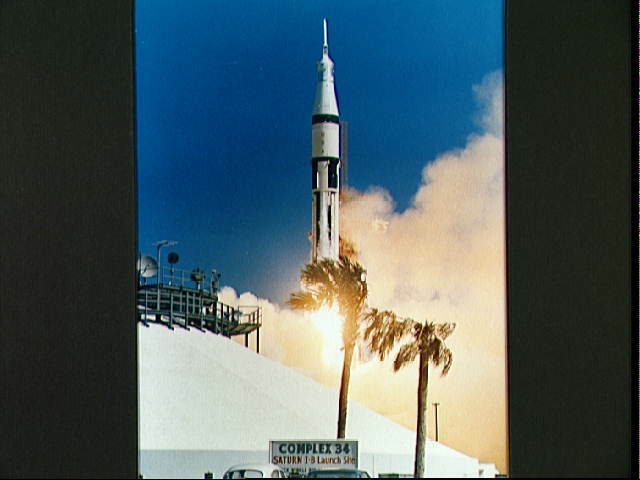 NASA launched Apollo 7 into Earth orbit, the first crewed Apollo mission. USSR launched Soyuz 6 from Baikonur to conduct welding experiments in space, and rendezvous with Soyuz 7 and 8. Soyuz 6 (call sign Antey/Antasus), was launched 11 October 1969 with cosmonauts Shonin and Kubasov aboard, to conduct welding experiments in vacuum, biomedical experiments, stellar observations, photography, and maneuvers with the Soyuz 7 and 8 spacecraft. Soyuz 6 was piloted by cosmonaut G. Shonin, Commander, and cosmonaut V. Kubasov, Flight Engineer. The announced mission objectives included (1) checkout and flight test of space borne systems and the modified structure of the Soyuz craft, (2) further inprovement of the control, orientation, and orbital stabilization systems and navigation aids, (3) debugging the piloting systems by orbital maneuvering of the spaceships in relation to one another, (4) testing of a system for control of the simultaneous flight of three spacecraft, (5) scientific observations and photographing of geological-geographical subjects and exploration of the Earth's atmosphere, (6) studying circumterrestrial space, and (7) conducting experiments of engineering research and biomedical importance. Stable two-way radio communications was maintained between the spaceships and the ground stations, and TV coverage was broadcast from the ships during flight. The most significant objective was testing alternate methods for welding using remote handling equipment in the high vacuum and weightless conditions of outer space. In Soyuz 6, a welding unit called Vulkan, for vacuum welding experiments in the depressurized orbital module, was controlled remotely by electric cable. Of the three types of welding tried (low pressure compressed arc, electron beam, and arc with a consumable electrode), electron beam was the most successful. Soyuz 6 also performed group flight with Soyuz 7 and Soyuz 8, but it did not dock with either spacecraft. Soyuz 6 was supposed to have taken spectacular motion pictures of a docking by the Soyuz 7 and Soyuz 8 crafts, but the failure of the rendezvous electronics in all three craft (due to a new helium pressurization integrity test prior to mission) did not permit successful rendezvous and dockings. Soyuz 6 returned to Earth on 16 October 1969. Crimean Astrophysical Observatory discovered asteroid #2698 Azerbaijan. The USSR Salyut 1 space station, the first to orbit the Earth, re-entered the Earth's atmosphere and burned up. The first space station, Salyut 1 (also called DOS 1 and Zarya), was launched 19 April 1971 from Baikonur Cosmodrome. Its announced purpose was to test the elements of the systems of a space station and to conduct scientific research and experiments. The cylindrical Soviet facility was 13.1 meters (43 feet) long (20 meters by some reports) and about 4.2 meters (13'9") across (outside dimensions), designed for a crew of three. Of its several compartments, three were pressurized (100 cubic m total), and two could be entered by the crew. The first (transfer) compartment was connected directly with the Soyuz craft that carried the crew from Earth. The second (main) compartment was about 4 meters in diameter. Televised views showed enough space for eight big chairs (seven at work consoles), several control panels, and 20 portholes (some unobstructed by instruments). The third pressurized compartment contained the control and communications equipment, the power supply, the life support system, and other auxiliary equipment. The fourth, and final, compartment (unpressurized) was about 2 meters in diameter, and contained the engines and associated control equipment. Salyut had buffer chemical batteries, reserve supplies of oxygen and water, and regeneration systems. Externally mounted were two double sets of solar cell panels that extended like wings from the smaller compartments at each end, the heat regulation system's radiators, and orientation and control devices. After taking 24 hours for rendezvous and approach, Soyuz 10 docked with Salyut on 23 April 1971 and remained docked for 5.5 hours. The crew (Vladimir Shatalov, Alexei Yeliseyev and Nikolai Rukavishnikov) did not transfer to the space station because their docking mechanism was damaged during the attempt, but spent 21 days orbiting the Earth. Soyuz 11 required 3 hours 19 minites on 7 June 1971 to complete docking. The next crew (Georgi Dobrovolski, Vladislav Volkov and Viktor Patsayev) spent 22 days on the station. Their mission was announced as (1) checking and testing the design, units, onboard systems, and equipment of the orbital piloted station, (2) trying out the methods and autonomous means of the station's orientation and navigation, as well as the systems for controlling the space complex while maneuvering in orbit, (3) studying geological-geographical objects on the Earth's surface, atmospheric formations, and the snow and ice cover of the Earth, (4) studying physical characteristics, processes, and phenomena in the atmosphere and outer space in various ranges of the spectrum of electromagnetic radiation, and (5) conducting medico-biological studies to determine the possibilities of performing various jobs by the cosmonauts in the station and study the influence of space flight factors on the human organism. On 29 June, after flying 362 orbits docked with Salyut, the Soyuz 11 crew transferred back to Soyuz 11; they died during the return trip to Earth because of a hatch seal failure. Originally designed to last three months, Salyut 1 was kept aloft to study how the systems behaved over an extended period, in order to identify fixes to improve their reliability on later flights. It was moved to higher orbits in July and August of 1971 to ensure that it would not end through early decay. During the extended period fuel consumption and the ballistic and drag characteristics of the station were determined. Use of the reaction control system became difficult after an electrical failure in early October. Georgiy Degytyarenko recommended to Mishin that the station be deorbited safely into the Pacific Ocean without delay before complete control was lost. Mishin agreed and the signal was transmitted from Yevpatoriya on 10 October. The same procedure was followed for all subsequent stations except Salyut 7 (where control was completely lost). On 11 October 1971, the Salyut 1 engines were fired, for the last time, to lower its orbit and ensure prompt decay over the Pacific Ocean. After 175 days in orbit, the first real space station disintegrated when it reentered the Earth's atmosphere, never having been used again. USSR Soyuz 25, crewed by Vladimir Kovalyonok and Valeri Ryumin, landed after an unsuccessful flight which did not dock at Salyut 6, the eighth Soviet space station mission to fail in 13 attempts. Purple Mountain Observatory discovered asteroid #3014. N. Chernykh discovered asteroid #2910 Yoshkar-Ola. USSR's Soyuz 37 landed with the Soyuz 35 crew of Popov and Ryumin aboard, returning from the Salyut 6 space station. IRAS discovered asteroid #3200 Phaethon. During the 3h 30m STS-41-G-1 EVA, Challenger astronauts Leestma and Sullivan simulated refuelling of a satellite during an EVA in which Dr. Kathryn D. Sullivan became the first American woman to walk in space. C. and E. Shoemaker discovered asteroid #3640 Gostin. Russia launched the Progress M-20 unmanned resupply vessel from Baikonur to the Mir space station. Russia launched the Progress M-20 unmanned resupply vessel from Baikonur to the Mir space station, carrying a Raduga reentry capsule for return of experimental materials to Earth. An improved version of cargo freighters used to supply the Mir space station, the Progress M series had greater cargo capacity, a modernized approach/docking system and carried 2 solar panels to generate electrical power. Progress M-20 docked with Mir on 13 Oct 1993 23:24:46 GMT, and undocked on 21 Nov 1993 02:38:43 GMT. The capsule landed in Kazakhstan on 21 Nov 1993 09:06:00 GMT. Total free-flight time 2.35 days. Total docked time 38.13 days. NASA's STS 68 (Endeavour 7, 65th Shuttle mission) ended after carrying the Space Radar Laboratory-2 (SRL 2) package to orbit. The first launch attempt of STS 68 on 18 August 1994 was halted at T-1.9 seconds when the orbiter's computers shut down all three main engines after detecting an unacceptably high discharge temperature in the high pressure oxidizer turbopump turbine for main engine number three. Endeavour was returned to the Vehicle Assembly Building (VAB) and all three engines were replaced. The countdown for the second launch attempt proceeded smoothly to an on time liftoff on 30 September 1994. STS 68 marked the second flight in 1994 of the Space Radar Laboratory (the first flight was STS 59 in April), part of NASA's Mission to Planet Earth. Flying SRL during different seasons allowed comparison of the changes between the first and second flights. SRL-2 was activated on flight day one, and around-the-clock observations were conducted by the astronauts, split into two teams. Besides repeating data takes over the same locations as on the first flight, unusual events were also imaged, including an erupting volcano in Russia and the islands of Japan after the earthquake there. Also tested was the ability of SRL-2 imaging radars, Spaceborne Imaging Radar-C (SIR-C) and X- band Synthetic Aperture Radar (X-SAR), to discern difference between such human-induced phenomena as an oil spill in the ocean and a naturally occurring film. The mission also took advantage of the opportunity to study fires set in British Columbia, Canada, for forest management purposes. Special readings were taken with another SRL element, Measurement of Air Pollution from Satellites (MAPS), to gain a better understanding of carbon monoxide emissions from the burning forest. Flying for the fourth time on the Shuttle, MAPS was designed to measure the global distribution of carbon monoxide. On flight day six, the mission was extended one day by the Mission Management Team. The maneuvering capability of the orbiter was demonstrated anew in the latter half of the mission, when a different data-gathering method was tried. Called interferometry, it required repeated, nearly coincidental imaging passes with the SIR-C/X-SAR over target sites. In one instance, was Endeavour piloted to within 30 feet (nine meters) of where it was flown on the first flight in April. The collected data can be transcribed into detailed topographic images showing elevation and other features. Interferometric passes were completed over central North America, the Amazon forests of central Brazil, and the volcanoes of the Kamchatka Peninsula in Russia. Such images, if produced regularly over a long term, could provide information on movements of the Earth's surface as small as fraction of an inch, which could be invaluable in detecting pre-eruptive changes in volcanoes and movements in fault lines before earthquakes. Other cargo bay payloads flown on STS 68 included five Get Away Special (GAS) cannisters: two sponsored by university student groups, one by the Swedish Space Corporation, and two by the US Postal Service holding 500,000 commemorative stamps honoring the 25th anniversary of Apollo 11. The middeck payloads on STS 68 were: Commercial Protein Crystal Growth (CPCG) to study dynamics of protein crystallization and to obtain protein crystals large enough to allow structural analysis; Biological Research in Canisters (BRIC-01), flying for first time and holding gypsy moth eggs to determine how microgravity affects moth development; CHROMEX-05, fifth in series designed to examine effects of microgravity on physiological processes in plants. Previous CHROMEX flights have shown that plants grown in space may not produce seed embryos; CHROMEX-05 was designed to show whether infertility is due to microgravity or an another environmental factor. Also in middeck were: Cosmic Radiation Effects and Activation Monitor (CREAM), to collect data on cosmic rays; and Military Applications of Ship Tracks (MAST), part of a five-year Navy effort to study the effects of ships on the marine environment. Problems encountered during STS 68 included a missing tile around an overhead window; a suspect temperature sensor on an orbiter Reaction Control System (RCS) vernier thruster, which led to a temporary cessation of SRL-2 radar observations; and a failed primary RCS thruster. STS 68 ended 11 October 1994 when Endeavour landed on revolution 182 on Runway 22, Edwards Air Force Base, California. Rollout distance: 8,495 feet (2,589 meters). Rollout time: 60 seconds. Orbit altitude: 120 nautical miles. Orbit inclination: 57 degrees. Mission duration: 11 days, five hours, 46 minutes, eight seconds. Miles traveled: 4.7 million. OV-105 was returned to KSC atop the 747 Shuttle Carrier Aircraft on 12 October 1994. The landing was diverted to Edwards due to unacceptable weather at Kennedy Space Center. Post-landing video showed what appeared to be water dripping from the area of the centerline latch for the orbiter/external tank doors; the source was later found to be a cracked valve in water spray boiler number three. The flight crew for STS 68 was: Michael A. Baker, Commander; Terrence W. Wilcutt, Pilot; Thomas D. Jones, Payload Commander; Steven L. Smith, Mission Specialist 1; Daniel W. Bursch, Mission specialist 2; Peter J.K. Wisoff, Mission Specialist 3. Russia launched Luch 1 from Baikonur, an improved Altair/SR geosynchronous military satellite for communication with the Mir space station and other orbital spacecraft, positioned in geosynchronous orbit at 77 deg E.
NASA launched STS 92 (Discovery 28, Shuttle 100) for the International Space Station Flight 3A mission.